Becquerel discovered the photovoltaic effect in selenium in 1839. The conversion efficiency of the "new" silicon cells, developed in 1958, was 11%, although the cost was prohibitively high ($1000/W). The first practical application of solar cells was in space, where cost was not a barrier, since no other source of power is available. Research in the 1960s resulted in the discovery of other photovoltaic materials such as gallium arsenide (GaAs). These could operate at higher temperatures than silicon but were much more expensive. The global installed capacity of photovoltaics at the end of 2002 was near 2 GWp (Lysen, 2003). Photovoltaic cells are made of various semiconductors, which are materials that are only moderately good conductors of electricity. The materials most commonly used are silicon (Si) and compounds of cadmium sulphide (Cds), cuprous sulphide (Cu2S), and gallium arsenide (GaAs). Amorphous silicon cells are composed of silicon atoms in a thin homogenous layer rather than a crystal structure. Amorphous silicon absorbs light more effectively than crystalline silicon, so the cells can be thinner. For this reason, amorphous silicon is also known as a thin film PV technology. Amorphous silicon can be deposited on a wide range of substrates, both rigid and flexible, which makes it ideal for curved surfaces and "foldaway" modules. Amorphous cells are, however, less efficient than crystalline-based cells, with typical efficiencies of around 6%, but they are easier and therefore cheaper to produce. Their low cost makes them ideally suited for many applications where high efficiency is not required and low cost is important. 1. Silicon is abundant and environmentally safe. 2. Amorphous silicon absorbs sunlight extremely well, so that only a very thin active solar cell layer is required (about 1 |m as compared to 100 |m or so for crystalline solar cells), thus greatly reducing solar cell material requirements. 3. Thin films of a-Si can be deposited directly on inexpensive support materials such as glass, sheet steel, or plastic foil. A number of other promising materials, such as cadmium telluride (CdTe) and copper indium diselenide (CIS), are now being used for PV modules. The attraction of these technologies is that they can be manufactured by relatively inexpensive industrial processes, in comparison to crystalline silicon technologies, yet they typically offer higher module efficiencies than amorphous silicon. The PV cells are packed into modules that produce a specific voltage and current when illuminated. PV modules can be connected in series or in parallel to produce larger voltages or currents. 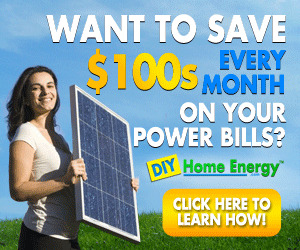 Photovoltaic systems can be used independently or in conjunction with other electrical power sources. Applications powered by PV systems include communications (both on earth and in space), remote power, remote monitoring, lighting, water pumping, and battery charging. The two basic types of PV applications are the stand-alone and the grid-connected systems. Stand-alone PV systems are used in areas that are not easily accessible or have no access to mains electricity grids. A stand-alone system is independent of the electricity grid, with the energy produced normally being stored in batteries. A typical stand-alone system would consist of PV module or modules, batteries, and a charge controller. An inverter may also be included in the system to convert the direct current (DC) generated by the PV modules to the alternating current form (AC) required by normal appliances. In the grid-connected applications, the PV system is connected to the local electricity network. This means that during the day, the electricity generated by the PV system can either be used immediately (which is normal for systems installed in offices and other commercial buildings) or sold to an electricity supply company (which is more common for domestic systems, where the occupier may be out during the day). In the evening, when the solar system is unable to provide the electricity required, power can be bought back from the network. In effect, the grid acts as an energy storage system, which means the PV system does not need to include battery storage. When PVs started to be used for large-scale commercial applications about 20 years ago, their efficiency was well below 10%. Nowadays, their efficiency has increased to about 15%. Laboratory or experimental units can give efficiencies of more than 30%, but these have not been commercialized yet. Although 20 years ago PVs were considered a very expensive solar system, the present cost is around $5000/kWe, and there are good prospects for further reduction in the coming years. 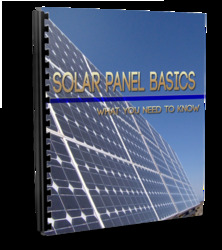 More details on photovoltaics are included in Chapter 9 of this book. The lack of water was always a problem to humanity. Therefore, among the first attempts to harness solar energy was the development of equipment suitable for the desalination of seawater. Solar distillation has been in practice for a long time (Kalogirou, 2005). FIGURE 1.6 Sailors producing freshwater with seawater distillation. sailors at sea boiled seawater and suspended large sponges from the mouth of a brass vessel to absorb what evaporated. 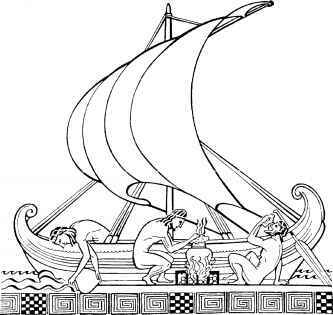 In drawing this liquid off the sponges, they found it was sweet water (Kalogirou, 2005). Solar distillation has been in practice for a long time. According to Malik et al. (1985), the earliest documented work is that of an Arab alchemist in the 15th century, reported by Mouchot in 1869. Mouchot reported that the Arab alchemist had used polished Damascus mirrors for solar distillation. Until medieval times, no important applications of desalination by solar energy existed. During this period, solar energy was used to fire alembics in order to concentrate dilute alcoholic solutions or herbal extracts for medical applications and to produce wine and various perfume oils. The stills, or alembics, were discovered in Alexandria, Egypt, during the Hellenistic period. Cleopatra the Wise, a Greek alchemist, developed many distillers of this type (Bittel, 1959). One of them is shown in Figure 1.7 (Kalogirou, 2005). The head of the pot was called the ambix, which in Greek means the "head of the still," but this word was applied very often to the whole still. The Arabs, who overtook science and especially alchemy about the seventh century, named the distillers Al-Ambiq, from which came the name alembic (Delyannis, 2003). Mouchot (1879), the well-known French scientist who experimented with solar energy, in one of his numerous books mentions that, in the 15th century, Arab alchemists used polished Damascus concave mirrors to focus solar radiation onto glass vessels containing saltwater to produce freshwater. He also reports on his own solar energy experiments to distill alcohol and an apparatus he developed with a metal mirror having a linear focus in which a boiler was located along its focal line. Later on, during the Renaissance, Giovani Batista Della Porta (1535-1615), one of the most important scientists of his time, wrote many books, which were translated into French, Italian, and German. In one of them, Magiae Naturalis, which appeared in 1558, he mentions three desalination systems (Delyannis, 2003). In 1589, he issued a second edition in which, in the volume on distillation, he mentions seven methods of desalination. The most important of them is a solar distillation apparatus that converted brackish water into freshwater. In this, wide earthen pots were used, exposed to the intense heat of the solar rays to evaporate water, and the condensate collected into vases placed underneath (Nebbia and Nebbia-Menozzi, 1966). He also describes a method to obtain freshwater from the air (what is known today as the humidification-dehumidification method). Around 1774, the great French chemist Lavoisier used large glass lenses, mounted on elaborate supporting structures, to concentrate solar energy on the contents of distillation flasks. The use of silver- or aluminum-coated glass reflectors to concentrate solar energy for distillation has also been described by Mouchot. In 1870, the first American patent on solar distillation was granted to the experimental work of Wheeler and Evans. Almost everything we know about the basic operation of the solar stills and the corresponding corrosion problems is described in that patent. The inventors described the greenhouse effect, analyzed in detail the cover condensation and re-evaporation, and discussed the dark surface absorption and the possibility of corrosion problems. High operating temperatures were claimed as well as means of rotating the still in order to follow the solar incident radiation (Wheeler and Evans, 1870). Two years later, in 1872, an engineer from Sweden, Carlos Wilson, designed and built the first large solar distillation plant, in Las Salinas, Chile (Harding, 1883); thus, solar stills were the first to be used on large-scale distilled water production. The plant was constructed to provide freshwater to the workers and their families at a saltpeter mine and a nearby silver mine. They used the saltpeter mine effluents, of very high salinity (140,000 ppm), as feedwater to the stills. The plant was constructed of wood and timber framework covered with one sheet of glass. It consisted of 64 bays having a total surface area of 4450 m2 and a total land surface area of 7896 m2. It produced 22.70 m3 of freshwater per day (about 4.9 L/m2). The still was operated for 40 years and was abandoned only after a freshwater pipe was installed, supplying water to the area from the mountains. In the First World Symposium on Applied Solar Energy, which took place in November 1955, Maria Telkes described the Las Salinas solar distillation plant and reported that it was in operation for about 36 continuous years (Telkes, 1956a). The use of solar concentrators in solar distillation was reported by Louis Pasteur, in 1928, who used a concentrator to focus solar rays onto a copper boiler containing water. The steam generated from the boiler was piped to a conventional water-cooled condenser in which distilled water was accumulated. A renewal of interest in solar distillation occurred after the First World War, at which time several new devices had been developed, such as the roof-type, tilted wick, inclined tray, and inflated stills. Before the Second World War only a few solar distillation systems existed. One of them, designed by C. G. Abbot, is a solar distillation device, similar to that of Mouchot (Abbot, 1930; 1938). At the same time some research on solar distillation was undertaken in the USSR (Trofimov, 1930; Tekuchev, 1938). During the years 1930-1940, the dryness in California initiated the interest in desalination of saline water. Some projects were started, but the depressed economy at that time did not permit any research or applications. Interest grew stronger during the Second World War, when hundreds of Allied troops suffered from lack of drinking water while stationed in North Africa, the Pacific islands, and other isolated places. Then a team from MIT, led by Maria Telkes, began experiments with solar stills (Telkes, 1943). At the same time, the U.S. National Research Defense Committee sponsored research to develop solar desalters for military use at sea. Many patents were granted (Delano, 1946a; 1946b; 1946c) for individual small plastic solar distillation apparatuses that were developed to be used on lifeboats or rafts. These were designed to float on seawater when inflated and were used extensively by the U.S. Navy during the war (Telkes, 1945). Telkes continued to investigate various configurations of solar stills, including glass-covered and multiple-effect solar stills (Telkes, 1951; 1953; 1956b). The explosion of urban population and the tremendous expansion of industry after the Second World War again brought the problem of good-quality water into focus. In July 1952, the Office of Saline Water (OSW) was established in the United States, the main purpose of which was to finance basic research on desalination. The OSW promoted desalination application through research. Five demonstration plants were built, and among them was a solar distillation plant in Daytona Beach, Florida, where many types and configurations of solar stills (American and foreign) were tested (Talbert et al., 1970). G. O. G. Loef, as a consultant to the OSW in the 1950s, also experimented with solar stills, such as basin-type stills, solar evaporation with external condensers, and multiple-effect stills, at the OSW experimental station in Daytona Beach (Loef, 1954). In the following years, many small-capacity solar distillation plants were erected on Caribbean islands by McGill University of Canada. Everett D. Howe, from the Sea Water Conversion Laboratory of the University of California, Berkeley, was another pioneer in solar stills who carried out many studies on solar distillation (Kalogirou, 2005). Australian desert, providing freshwater from saline well water for people and livestock. At the same time, V. A. Baum in the USSR was experimenting with solar stills (Baum, 1960; 1961; Baum and Bairamov, 1966). Between 1965 and 1970, solar distillation plants were constructed on four Greek islands to provide small communities with freshwater (Delyannis, 1968). The design of the stills, done at the Technical University of Athens, was of the asymmetric glass-covered greenhouse type with aluminum frames. The stills used seawater as feed and were covered with single glass. Their capacity ranged from 2044 to 8640 m3/d. In fact, the installation in the island of Patmos is the largest solar distillation plant ever built. On three more Greek islands, another three solar distillation plants were erected. These were plastic-covered stills (ted-lar) with capacities of 2886, 388, and 377 m3/d, which met the summer freshwater needs of the Young Men's Christian Association (YMCA) campus. Solar distillation plants were also constructed on the islands of Porto Santo and Madeira, Portugal, and in India, for which no detailed information exists. Today, most of these plants are not in operation. Although a lot of research is being carried out on solar stills, no large-capacity solar distillation plants have been constructed in recent years. A number of solar desalination plants coupled with conventional desalination systems were installed in various locations in the Middle East. The majority of these plants are experimental or demonstration scale. A survey of these simple methods of distilled water production, together with some other, more complicated ones, is presented in Chapter 8.